Janitorial - ACHIEVE Human Services, Inc.
No matter what particular office janitorial services you require ACHIEVE Human Services has you covered due to our many years of operation providing office janitorial services. 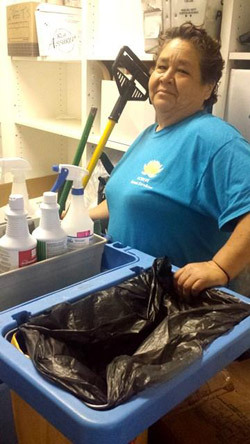 In Yuma County ACHIEVE has realized that each facility has its own very specific set of needs that require attention. All of our employees are professional, experienced and friendly. ACHIEVE is able to provide helpful recommendations to improve your office cleaning services. Why choose ACHIEVE Human Services for your janitorial services? Non-Profit organization serving the Yuma Area for over thirty years. Making a difference helping individuals with disabilities. ACHIEVE is a non-profit organization which is licensed and insured. All estimates are free so give us a call NOW!